1. Why Does Makoto Live Alone? Not only did Makoto get me into the series in the first place, but you can even trace the origins of this blog back to her as well! The very first article written for Tuxedo Unmasked (before the blog even had a name!) was about Makoto’s living situation, and just how it is possible for a 14 year old girl to live entirely on her own. In addition to the legalities concerning a kid living alone in the big city, I took a look at the real life plane crash that shook Japan several back in the 1980s, and which may have inspired Makoto’s tragic back story. 2. What is Sailor Jupiter’s True Element – Lightning or Wood? Okay, to be fair, “plant life” or even “wind” would probably have been a more accurate description when you consider Sailor Jupiter’s “Flower Hurricane” and “Coconut Cyclone” attacks. Live and learn! With that in mind, though, it was especially interesting for me to take a look back at the evolution of Sailor Jupiter’s character over time and how the anime and manga went totally different directions. 3. Was Makoto a Member of a Gang? While we all know Makoto for her strength and somewhat rough-and-tumble demeanor, many forget just how much of a delinquent Ms. Takeuchi originally wanted her to be. Between her original concept sketches depicting Makoto (then known as “Mamoru”) as a smoker and the fact that Makoto actually buys alcohol in the manga, it’s pretty clear that this was meant to be a much rougher character than the one she later evolved into. 4. What Food Did Makoto Make For Her Lunch? I fully acknowledge that this is something not many people stay up late at night thinking about, but hey, I live for this kind of trivia! The fact that Makoto’s lunch is actually fairly consistent across nearly all three major versions (manga, 90s anime, and Crystal) of the series still impresses me. That’s some amazing attention to detail for something that, admittedly, doesn’t matter at all. One of these days, I really want to sit down and make a Mako-chan special for myself! 5. What is the Origin Behind Sailor Jupiter’s Attack Pose? Speaking of Mako-chan, it turns out that our darling Soldier of Lightning Wood Flowers wasn’t the only popular Makoto floating around in the manga sphere. Though these two characters couldn’t possibly any more different — one being a junior high school girl in an adventure/romance manga and the other being an elementary school boy in a story centered around slapstick comedy — somehow, someway, their stories became intertwined. And her Supreme Thunder hand gesture is the smoking gun. Speaking of poses, I still can’t get over the fact that many of Makoto’s fighting stances come directly from Bruce Lee films. Pretty shocking! Thank you, Makoto, for being so awesome that you got me into this series in the first place. I owe a lot to this character and, as weird as it sounds, I definitely think her birthday is worth celebrating! Personally speaking, I’d say that the live action version of Makoto is probably my favorite, especially since it’s one of the few versions of the series where she actually gets a proper love interest. If you have any questions you’d like me to look into about Makoto – be it manga, anime, or even the live-action show! – I’d love to hear about it in the comments below! ← What Other Anime Have the Sailor Moon Cast Worked on Together? Thank you for another awesome article! For me, Sailor Jupiter/Mako-Chan was the whole reason I got into martial arts. One of my Fourth Degree (TKD) goals is to watch ALL of the Bruce Lee movies. I had no idea she also used the same hand striking/blocking style as him! And also, “Hana-Chan” on the cake?? I’m surprised that I never knew when Makoto’s birthday was before, considering that she’s my favorite character in the series. I always knew that Usagi and Chibiusa are in June and Ami is in September (that one stuck because school starts in September, and Ami love school), and I remember Michiru is in March because she and I are both Pisces. 1) The living alone thing seems even weirder today in the age of helicopter parents whose children rarely go outside to play. But in the past, and especially in a non-Western country, maybe it wasn’t considered that crazy to have a teenager live alone, if they have money to provide for them. Maybe a friend of Makoto’s parents or a neighbor check in on her occasionally to make sure she’s doing OK? Some 14 year olds can take care of themselves. But here’s another thing… how long has she been living alone? A 14 year old living alone, maybe… but at 13, 12, 11, 10 or younger? 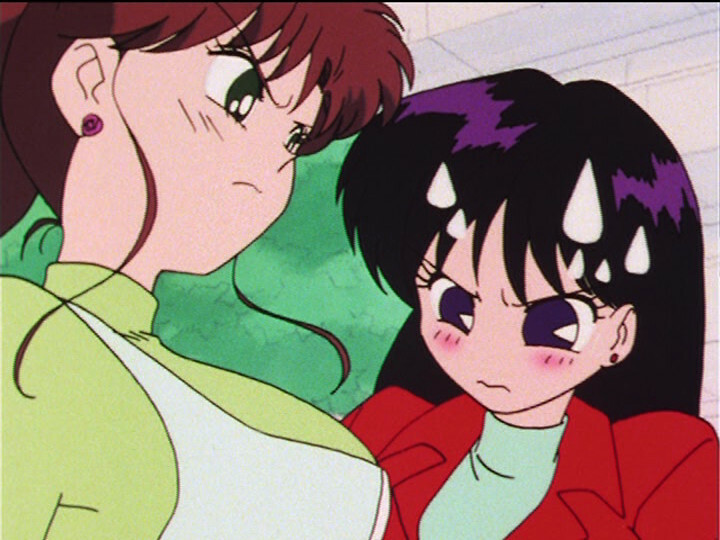 Did Makoto live with other people before she moved to Usagi’s area? I think she must have. Maybe she didn’t get along with them either, the way she didn’t get along with her classmates. I wish more of that story had been told. 2) I bet you’re right, part of the change had to do with Tuxedo Mask being in charge of the roses. And there’s also the fact that Jupiter aka Zeus is the god of lightning, and the planet Jupiter has lots of storms full of lightning… and that lightning is a much more impressive attack than wind. I fully approve of this change for the TV series. 3) When does she buy alcohol? I never knew that. It definitely seems like at first she was meant to be a rougher character with a slow transition into being kind, but that idea was dropped and she was very kind to Usagi and the others right away. 4) You don’t mess with a perfect lunch! 5) I noticed Makoto would do those kinds of fighting stances, never knew it was directly from Bruce Lee though. I can count on you to notice all the obscure details like that. Cool bit of trivia there. 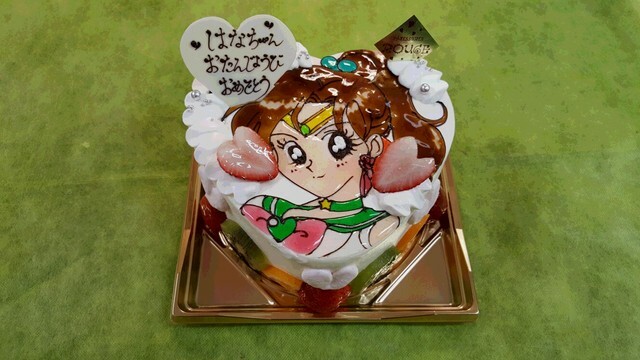 In response to the previous comment from Katie, I’m guessing that photo is from a birthday party for a girl named Hana, and she wanted a Sailor Jupiter cake. As for questions about Makoto… hmm, I don’t know what there would be that you haven’t already covered, like the stuff with her old uniform. There isn’t more information about her past or what age she was when her parents died, is there? And you might have covered this, but is there a particular significance to her rose earrings? No other character’s earrings got that kind of attention, they even zoom in to show her earrings during her transformation. I just assumed they’re kind of an acknowledgement to her flower-based powers in the manga. Speaking of which, didn’t the video games use more of her flowery attacks as well? She’s been my favorite since I was 8, and will always have a special place in my heart. I think that Ms. Takeuchi might have misinterpreted the meaning of thunder. In Japanese, Ikazuchi, which have the meaning of thunder, also includes the phenomenon of lightning, but thunder only means sound.